Welcome to the very 1st Tablescape Tuesday! I know summer is almost over, but I’m just not quite ready to let it go. I found some adorable shell candlesticks recently and put together this “beach” themed tablescape. Found the sea-blue flatware at Pier 1 recently and it was half off…whoo, hoo! Thought it worked well with the colors in the china…what do you think? Do you see the little starfish on the glass? Like you, I look forward to the beautiful colors of Fall, however I also am not ready for Summer to end. The candlesticks are exquisite. Sandra Lee has some good ideas, but the self-proclaimed Queen of execution (Martha Stewart) is the one that better watch her back. You are definitely gaining on her. Absolutely gorgeous. Now I’m off to see the other Wizards of Blogland. I don’t have a Toto, can I borrow Jake for a bit? BTW, absolutely love the music, I didn’t know the Drifters did “Under the Boardwalk”. I need to dig out my old CD of their top hits, and see if I have it. Love all the music. That is an era that I really appreciate. Susan, your tablescapes are wonderful! This one is so fun and fresh…just love it. Will have to copy the seashell napkin ring idea! It’d be great for an end of Summer party….. I’ll be there with bells on! Your music was perfect! Susan, I love the table setting, anyone would enjoy sitting at that table. Thanks for showing us. I’ve never seen beach dishes so sophisticated and cute! 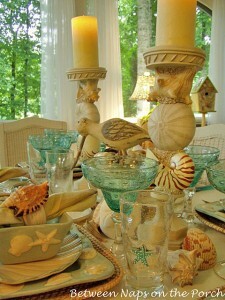 The sea blue glass, the shells, the candles, the bird… the lady behind the design…WOW! It’s so nice to meet you, I found you on Sheila’s blog. Oh sweet Susan! Oh, did I not say you were the absolute Queen Diva of Tablescapes? This table is just marvelous – couldn’t be any prettier. I still marvel at all the dishes, glasses, napkin rings, napkins, and all the accessories to go with them that you have!! This was a great idea and sign me up for next week. I’m loving this. Now I’m off to see the other table ladies! Dear Susan…no one can hold a candle to your tablescapes. You have such lovely, unusual pieces and your talent to put them all together puts most of us “in the shade”. I will do a tablescape for NEXT Tuesday…I didn’t get it all together fast enuf for today. Hi Susuan, I joined in too! Thank you for doing this because I had no idea what I was going to put on my blog today! Good morning, well, sorry a little late, but my post is up. I hope you have time to add it. I will try to do better next week! P.S. Boy, I am spacey today!!! Your table is fantastic. I hope my friend at Mimi’s garden sees it. She is mad for seashells. Susan, this is wonderful! What a great idea to glue on the seashells. I will participate as soon as I can get my act, er, my dishes together. 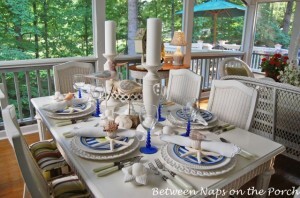 Susan, I’m so very happy you decided to create Tablescape Tuesday’s on your blog. I always loved your tablescapes on RMS but the system was so slow there in changing pages that I wasn’t able to see all of the pictures you posted. Now that you’ve put them on a blog I have the luxery to seeing all of your pictures. Thank you! As for this incredible beach theme I LOVE IT! I’m off to see the other tablescapes now, and once again a big thank you from me. Second BTW, I checked and I do have "Under The Boardwalk" by the Drifters. It is on a CD that features The Drifters & The Coasters. When you do a gardening spot you might want The Coasters "Poison Ivy". I so love the old songs. Unfortunately, I remember when they came out. Makes me almost a day older than dirt. 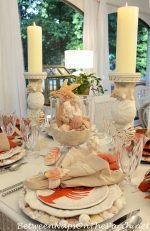 Hi Susan, I am so glad you decided to create a blog, I have loved your tablescapes for ever and now hopefully with your guidance I can make mine look as good as yours, these colours are beautiful and the shells and candlesticks are amazing. I have added you to my faves if that’s okay. Kathy (Ischia07) from RMS. Absolutely beautiful! Thanks so much for sharing! Thanks for adding me to your blog roll…I returned the favor and you are now on mine. This is a great idea for Tuesdays….I may try to put something together real soon. I love what you have done with yours…and providing the links to the others is so sweet of you! Hi Susan! Found you from Cindy's blog. What a wonderful idea for Tuesdays! I adore tablescape scenes! I hope I can join you soon! You have a beautiful home & oh, how I love your front entry!! Hi again Susan! I posted some pics of my favorite Rooster plates, so please add me to the party list!! I come to you by Cindys blog and all I can say is WOW. 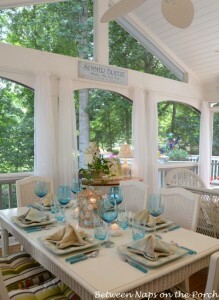 Your summer tablescape is probably the most beautiful and relaxing one I have ever had a privilege to view. So many beautiful pieces to your tablescape. I especially love the colors, and the candle holder. Again I say WOW. I LOVE LOVE LOVE your beach china!! Just beautiful! Susan,this was so much fun! i think you created a real winner here. can’t wait until next Tuesday. I have a dinner party this weekend ,so I will ahve a blast taking pics! this is my first time to visit,but I will be back. The table is so beautiful! Oh, Susan, I just had to come back! You’ve gotten 36 comments on your Tablescape Tuesday!! This is so wonderful! I do believe this is going to catch on!! You’re a doll and I knew if you ever started a blog it would be fantastic!! Well lookie here at you!!! When did you start a blog girl?!!! Didn’t nobody call me …didn’t nobody tell me!!!!! lol lol Ohhhh welcome to blogland…I love you tablescapes and your porch and well…just everything you do…I just don’t go to RMS anymore except to a few of the ones that come by the blog to visit from time to time…this is a great idea and oh I look forward to the inspiration this is gonna give…I am adding you to my list so I can find my way back here girl!!! I am so glad I found you! Have a great week! Thoroughly enjoyed your tablescape, lovely lovely colours and setting. I also enjoyed reading about the bluebirds. They are like our Blue Fairywrens which are so precious. I did get a little grossed out looking at the worms, but I hung in there, you are a brave woman. The thought of them being left in the fridge with the lid ajar, and bringing them out for a feast is just a bit too much. However, one has to do what one has to do, credit to you that the bluebirds are doing well. Wow, this is absolutely and utterly beautiful! I love the colors, the beach theme, just everything about it! It’s so stunning that it just takes my breath away! Well done! Wonderful! Please add my Holiday Hamlet blog to your list for next week! Your tablescape is lovely, so soft and summery. I did not post a new tablescape, my DD borrowed my camera (I did not realize I could use one of my old photos of tablescapes LOL), so I will hopefully have my camera back so I can post a new one on Tuesday. OH MY GOSH (she says with a loud excited voice). This is so gorgeous. I love tablescapes, dishes, centerpieces and all the lovely commotion that goes with it. How beautiful your table looks. I am always decorating for church potlucks or special holiday meals and I am always on the lookout for beautiful table ideas. I love this. Great post! I am on my way back to my blog to post mine. This is fun! Wow – everything is just beautiful!! We look forward to seeing what next week brings! I LOVE your seashell tablesetting. Absolutely everything about it just sends me! And the colors are so lovely! I’m an avid shell fan and have service for 12 of the old Fitz and Floyd “Coquilles” pattern. I’m so happy to have found your blog! Hey, Susan, I never got around to looking at the tablescapes from the very early days until now and WOW!!! This one is fabulous!!! I adore the candlesticks and would love to know where you got them (I know they're out of stock by now, but I can dream can't I?). They are gorgeous and I love your sweet napkin rings. I have some dishes similar to yours and I can't wait to try this tablescape at home this summer. Thanks! Those candlesticks came from HomeGoods back around 2008. I know a reader found some online back then after searching and searching. I'm not sure if you can still find them, but you never know. Google "seashell candlesticks" or "stacked shell candlesticks" and maybe someone is making them again. I hope you can some! Thank you so much!! Susan, you're the best!!! Thanks, Karin! 🙂 The candlesticks came from HomeGoods and the dishware came from Kohl’s. But were purchased around 4 years ago. I saw that the tableware came from Kohl’s several years ago. Was there a pattern name for it as well? Also, Can you tell me who made the glassware as well (both styles that are shown). Thanks! The dishware and the glassware are all from the same collection called the Shoreline Collection. The dishware says this on the back: “Shoreline Collection-Home Studio.” The glasses were part of that same collection. You may be able to find it on eBay or at Replacements.com. Kohl’s had it online the following summer after I purchased mine…but that’s been 5-6 years ago now. Hello! I came across your blog just searching the internet and was wondering what the brand of plates are, that you got and where I can purchase them? Thank you! On the back of the plates is says: Shoreline Collection-Home Studio. I found them in Kohl’s back in 2008. I’m not sure if they are still being made. You may want to check on eBay, as well.